CURRENTLY FULL. NAMES WILL GO ON WAIT LIST. 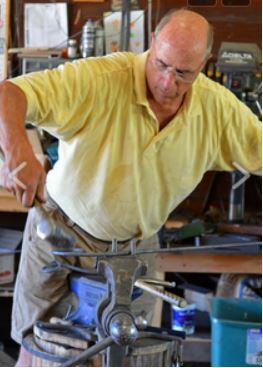 Join Jerry Merz of Methow Metalworks for a free introduction to blacksmitthing. Jerry will first introduce students to some of the tools unique to the trade spend some time explaining their safe operation. Then it is on to the forge for the “fun stuff”. Learn how to cut, fuller, draw out, bend, grind, drill and finish a piece of steel flatbar. Every participant will go home with a coat hook created with their own hands. Men and women with no blacksmithing experience but who would like to become familiar with the trade. Must not be overly afraid of sparks, flames and REALLY HOT steel. Participants are asked to bring their own ear/eye protection and to wear cotton clothing (that can get burn holes in it). Leather shoes preferred and, if you have them, leather gloves. Remember – cotton/leather GOOD – nylon/polyester BAD. LOCATION: At the Methow Metalworks studio, at the south end of the TwispWorks campus. CONTACT: To register or with questions contact Jerry Merz directly by email at jerry.merz@gmail.com. Please include your preferred date, or let me know if you have no preference between the two choices.